Lerici is situated in the eastern most part of the Spezia Gulf, near the estuary of the river Magra. Of ancient origin, it was once ruled over by the bishops of Luni. Its port was of great importance to travellers and pilgrims alike, who used to cross the Sarzana in order to join the Via Francigena, heading towards Rome and the north of Italy. 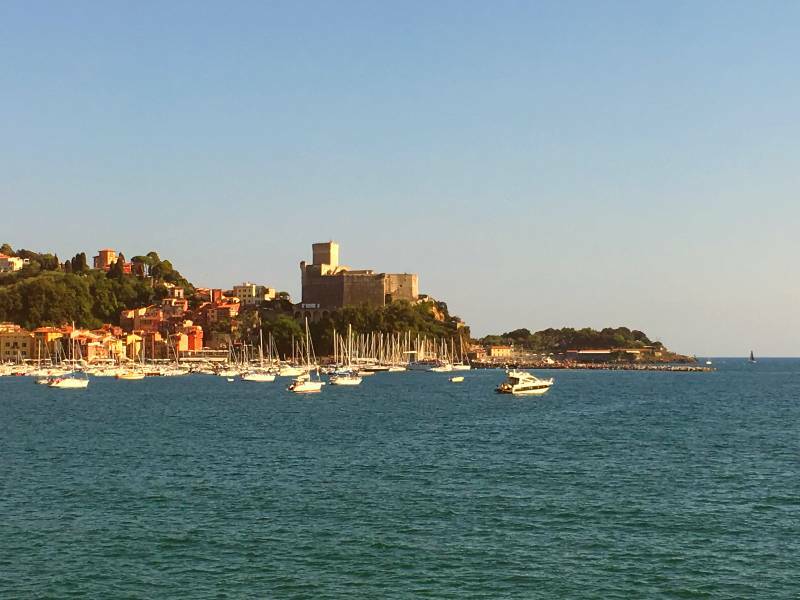 At Lerici, the Via Francigena forks off towards San Jacopo di Compostela. In Medieval times, the town belonged to Genova, passing briefly under Pisan rule before being reclaimed once again by Genova at the end of the 15th century. The town�s medieval origins are still highly evident in its layout, which consists of tightly bunched houses lining narrow streets and alleyways. The town boasts a particularly interesting Jewish quarter, a castle built by the Pisans in the 8th century and later expanded by the Genevans, a museum of palaeontology and the piazzas of Poggio and of San Giorgio. The castle houses a 12th century chapel, dedicated to Santa Anastasia. A footpath that winds round the foot of the castle and along the Vassello seafront makes for a relaxing walk. The town also boasts the tower of San Rocco, which dates back to Roman times and which was turned into a bell tower in the 16th century, as well as the church of San Francesco d�Assisi, the public speaking house of San Bernardino, and the Palazzo Doria, which is located not far from the former medieval hospice dedicated to Santi Pietro and Paolo. The Lerici region also encompasses the town of San Terenzo, home to Villa Magni, in which Percy Bysshe Shelley resided with his wife Mary, and Villa Marigola, which gives onto a glorious view of Venera Azzura beach. The town of Tellaro also falls under Lerici territory, and is a typical seaside town. The town boasts the ancient church of San Giorgio as well as the public speaking house of Santa Maria in Selaa. Villa Cochrane, located between Solaro and Pugliola and otherwise known as Villa Rezzola, is also worth a visit. Set in a park composed of eucalyptus plants, oak and heather, it is a veritable beauty spot. Other towns of interest are La Serra and Pozzuolo, located on a hill covered in olive groves; Senato, a tranquil and verdant oasis; and Solaro, a picturesque village facing out over the gulf.